Parakeets are social, friendly little birds. Training your parakeet to perch on your hand is easier once your bird has acclimated to your home and has come to know and trust you. Give him several days to get used to his new cage, then begin training. Get to know your bird before you start hand-training so he trusts you and accepts that you aren't threatening. Spend 10 to 15 minutes several times each day, sitting near his cage and talking in a soft voice. Your parakeet will begin to respond to your voice in a few days. Next, slowly put your hand inside the cage. Hold a treat for him, such as a leafy green vegetable or millet seed treat. Keep your hand still until he comes to investigate the treat. This may take several attempts, so be patient. Once you've established a bond with your bird, remove one of the perches from his cage. Hold it in your hand and press it against his breast, just above his feet. Talk to him while you do this, using a command word such as "up." Pressure from the perch will prompt him to step onto it; with repeated practice, your parakeet will associate the command with stepping onto the perch. Next, place your hand in the cage, finger extended. Talk to your budgie as you slowly place your finger in front of him as you did with the perch. Give the command word, and ask him to step onto your finger. Praise him when he does it. He will probably jump off several times, but continue to practice this for a few days until he is comfortable perching on your finger. Once your parakeet will confidently sit on your finger, slowly draw your hand out of the cage while he's perched on it. He will probably fly to the top of his cage, excited by the novelty of being outside. Give him a few minutes, then ask him to step onto your hand again. Repeat this for several days. 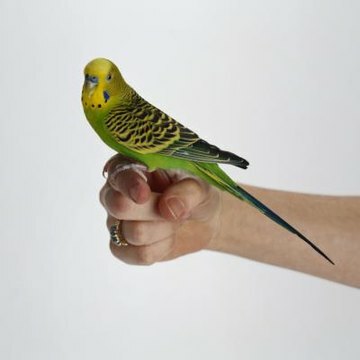 Gradually carry him around the room while you talk to him until he stays on your hand without flying back to his cage. Keep a treat in your other hand to reward him. This will encourage him to fly to your hand when you open his cage door. What Is the Best Way for Your Canary to Get to Know You?